Many of you were diligently watching radar this afternoon as snow moved towards the area from the west. You were excited by it's approach. You were disappointed by it "disappearing" from the radar loop as it got into Crittenden County, to our west. Of course, this visual didn't help to dispel the urban myths of the powers of the Pyramid and Bluff. So let me take a moment to explain what you were actually seeing using the example loops taken from this afternoon, a radar schematic, and a cross-section of the radar returns. First, here's one example of what you were likely seeing (click play and watch it a few times). Whoa! The snow coming in from Arkansas vanished as it got closer to Memphis! And if you looks close, it re-appears to our east! Must be the bluffs.... or the Pyramid... or the snow dome... or, or... maybe it just needs scientific explanation! Here's a loop taken just a bit earlier, as seen from StormView Radar, which many of you diligently use (thank you!). It seems there's a wall or giant snow-eater on the western side of Crittenden County. So what was really going on? Let me explain. Below is a similar scenario from a cross-sectional point of view (pretend the rain drops are snowflakes - and this is not exactly to scale). Precipitation fell into a very dry layer of air beneath the clouds. As it did, the precipitation evaporated before reaching the ground. It's very common when dry air is in place in the lowest few thousand feet of the atmosphere. The falling precip that evaporates is called virga (with a hard G). The radar scans upward slightly so the radar beam samples dry air (the red dashed line) out to about 20 miles in our scenario. When it gets past 20 miles, it "sees" the falling precipitation (blue dashed line) that had evaporated by the time it got to 3000 feet and so it paints precipitation on the radar display 20+ miles away from the radar. HOWEVER, as it turns out, that precipitation we see on radar is not actually reaching the ground! In the loop from StormView Radar above, the "snow" west of Memphis (say at Wynne) was actually well above ground, but not making it to the ground, a.k.a. virga. As you get closer to the radar (in Millington), the precip appears to vanish because the radar beam is closer to the ground and the precipitation has evaporated at that lower level. Thus, it appears the precipitation is dissipating as it moves closer to Memphis when really none of the precip to the west was reaching the ground in the first place! So how do we know it's not reaching the ground? A couple of ways - 1) your reports, or 2) cross-sections of the radar returns through the atmosphere (see below). #1 is why we VALUE your reports! Except right near the radar, it doesn't actually see what's going on at the ground level. We need your eyes and reports to let us know (especially when we know there is a lot of dry low-level air) if the precip is reaching the ground and what type it is. Note: it's also why we need reports of tornadoes, because the radar is typically looking above where where tornadoes form. They can't "see" tornadoes, though they can infer them. As for #2, let's take a look at a cross-section of virga from this evening. 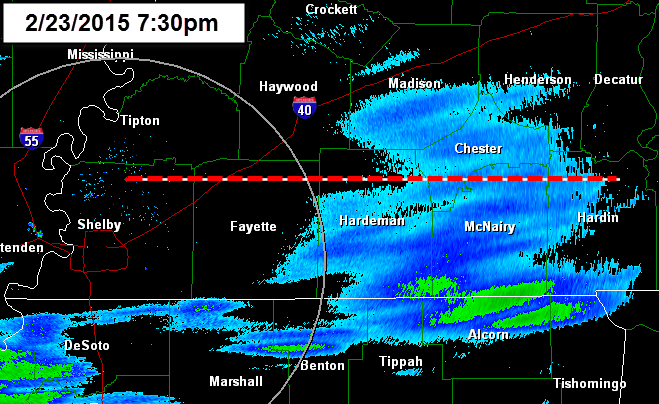 The first image below shows an area of precipitation east of Memphis at 7:30. There were no reports of precipitation in this case, but the radar sure looks like it's doing something! The red dashed line above represents the line along which the cross-section was taken below. In the image below, we are looking sideways along that dashed line with the ground at the bottom and the top of the image at 20,000'. The 5,000', 7,500', and 10,000' lines are also marked. 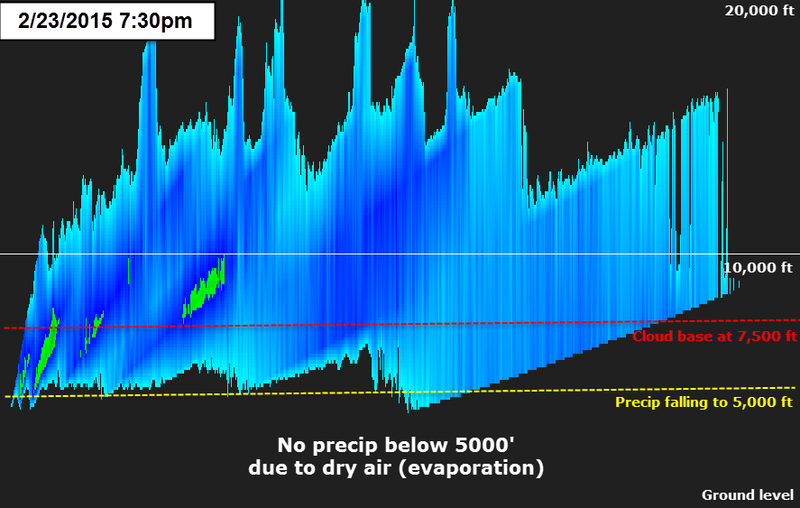 Precipitation appears from about 5,000' to about 15,000' (on average). Based on nearby observations, the base of the clouds was at about 7,500' (red horizontal line). So, the precipitation being detected is in the clouds from 7,500'-15,000'. The precipitation was falling from the clouds down to about 5,000' before dissipating due to the dry air it was falling into. So, while the top image shows precipitation over Hardeman, Chester, and McNairy Counties, a closer look actually shows this precipitation wasn't reaching the ground. 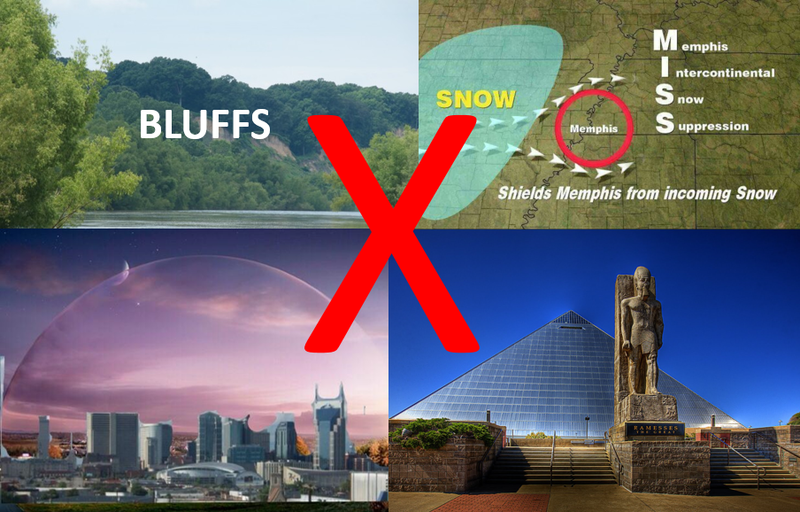 Bottom line: The bluffs, Pyramid, snow dome, and snow-eaters had NOTHING to do with the precipitation dissipating as it moved into Memphis. It was snow aloft that was evaporating before reaching the ground and the radar happened to "see" that precipitation where it was occurring - in the clouds and just below. When you get closer to the radar, the radar beam was below the evaporating precipitation and not seeing it. The fact that it showed back up on the east side of Memphis in the first loop above means that the same thing was happening over the radar as well - it just didn't see it due to the angle of the radar beam. Thanks for reading, and let me know if this helped you better understand what you were seeing on radar today! Weather 102 - A Step Further: The radar product being used above and on most web and app radars only shows what the lowest angle of the radar sees. Radar actually scan at many different "elevations" above ground. There are radar products that take data from all these levels and paint the radar image based on all of them. They are called Composite Reflectivity or Vertically Integrated Liquid Water (VIL). Some radar programs or web displays show these products. They don't necessarily show the "donut hole" around the radar site like the above loops do, but they do show all of the virga and tend to overestimate the actual intensity of the precipitation at the ground. That's a topic for another day! Thank you. It has been a standing joke that Memphis has M.I.S.S., Memphis International Snow Shield, which occasionally breaks. Extremely informative. Much appreciated. 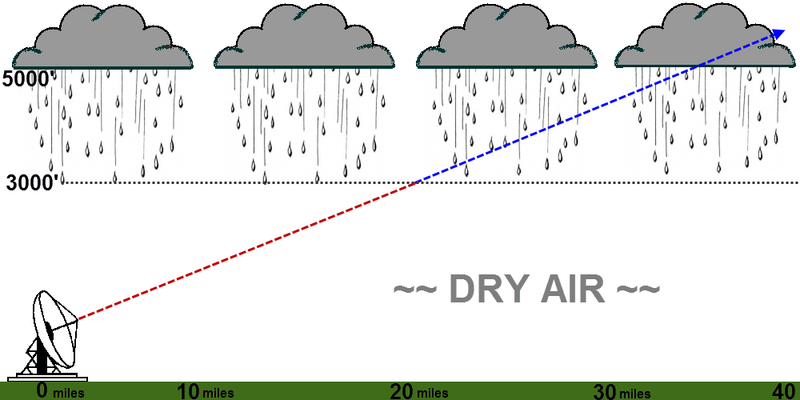 So why don't they mount the radar higher up to avoid ground clutter ( tall buildings, trees ect,) and have another moisture radar at lower angle relative to the ground to see the evaporating precipitation before broadcasting such radar loops that are inaccurate? Thanks very much for this. I've spent my whole life wondering why it never snows in Memphis. But this begs the question: why do we even look at radar if it's so misleading? Why is it always too dry here to get snow? Hukie - It would be nearly impossible to get the radar above all ground clutter and lower radar to see evaporating precip would be subject to the same clutter that the higher radar was trying to avoid. Jay - It's generally not misleading. But there are these times when it can appear to be. Radar was created for those trained to use it. The preponderance of weather data on the internet has resulted in the general public seeing lots of products meant for meteorologists. Just the nature of 21st century communications! Anon - it's not always too dry here to snow. In this case, it's just where the back edge of the precip set up. Collierville, Olive Branch, and Hernando (with 2-4") of snow was not a lot different humidity wide from Memphis ahead of this storm. The snow has to have a back edge somewhere! 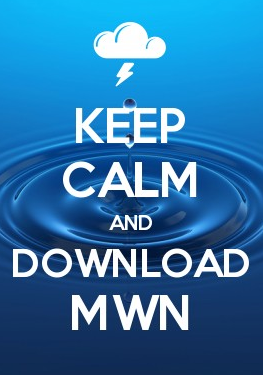 Thanks all for your comments and for reading the blog! No snow? Then how about spring? ?